Turbulence is a 1997 American disaster crime thriller film directed by Robert Butler and starring Ray Liotta and Lauren Holly. It was distributed by MGM Distribution Co.
Ryan Weaver (Ray Liotta) is arrested in New York City in connection for a series of murders that he says he did not commit. Even though Police Lieutenant detective Aldo Hines (Héctor Elizondo) at one point broke protocol during the arrest (which later enraged Weaver), the authorities have hard evidence and that Weaver must be transported to Los Angeles to face trial. He and another prisoner, Stubbs (Brendan Gleeson), are escorted by four US marshals on a Boeing 747-200 on a commercial flight. Even though it is Christmas Eve, the 747 is nearly empty, with only 11 people on board. The entire cabin is highly decorated with Christmas trees and other decorations. During the 5 hour flight, Stubbs breaks free while using the bathroom and begins a shootout with the marshals, and at some point in the fight, a stray bullet fired from one of the Marshall's sidearms punches a hole in the fuselage, instantly triggering an explosive decompression. Amidst the chaos, the Captain is fatally shot, and the First Officer is also killed when his head slams into the yoke, disengaging the autopilot in the process. Weaver frees himself and attempts to save the last remaining marshal, but fails when both Stubbs shoots the marshal dead, after being shot himself. Weaver appears to be horrified by the ordeal, increasing the passengers' trust in him. 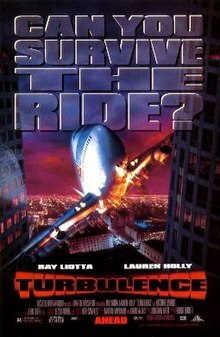 Because of the death of the pilots, Teri Halloran (Lauren Holly), a flight attendant, makes her way into the cockpit and learns she is the only one left capable of keeping the 747 from crashing. To make matters worse, the plane is heading for a storm which threatens level 6 (severe) turbulence. Weaver's behavior becomes increasingly erratic since he is paranoid of being sentenced to death upon landing and occasionally suffers nervous breakdowns. He then locks the passengers in the crew's cabin; and sexually assaults and strangles Maggie (Catherine Hicks), one of the other flight attendants, to death. He then calls LAX FBI control center and threatens to crash the 747 into their facility since he is now on a suicide mission, and is willing to do anything to avoid being arrested. His motives had become clear to Teri after she spoke, via the aircraft's radio, with detective Hines who arrested him. Being the only hope for the 747's survival, Teri must be instructed by radio from Captain Bowen (Ben Cross) of how to land, but her task complicates when Weaver repeatedly interrupts, asking obscene questions and his attempts to assault her. After the plane barely survives extreme turbulence during the storm, Teri's first landing attempt is unsuccessful, with the 747 descending too rapidly. It skims an office building's top floor Japanese restaurant, and a multi-story parking lot, due to Weaver altering the circuitry in the avionics bay. As the plane's landing gear collides with several vehicles, it picks up an SUV, which prevents the plane landing at LAX and had to abort. Redundant backup systems engage, and Teri makes efforts to turn the plane around. The LAX airport chief sends a U.S. Navy F-14 Tomcat Fighter jet to intercept the 747. Teri begs LAX not to have her shot down as a result of her failed first attempt caused by Weaver, and insists that she can land the plane. At this point, Weaver - completely drunk and crazy, breaks into the cockpit with an axe and tries to murder her, but the F-14 shoots down the SUV instead, shaking up the 747 and giving Teri a chance to attack. She grabs one of the marshal's guns and in the midst of Weaver's assault of pinning her down, she manages to load the gun with a spare bullet. While she has him at gunpoint, Weaver says she's not gonna kill him because she doesn't believe in capital punishment, but Teri states she changed her mind. She squeezes the trigger hoping the gun would go off, it finally does, shooting Weaver through the head and killing him. Teri returns to the pilot's seat and with Bowen's radio assistance, she safely lands the 747 using the autopilot. Despite the claims of Weaver that he killed them all, the other crew and passengers are found alive. Turbulence grossed $11 million domestically on a $55 million budget. Rotten Tomatoes, a review aggregator, gave it an approval rating of 17% with three positive and 15 negative out of 18 reviews; the average rating was 3.2 out of 10. Audiences polled by CinemaScore gave the film an average grade of "B-" on an A+ to F scale. Both Roger Ebert and James Berardinelli rated the film one star out of four, denouncing the implausible storyline as well as the casting of Lauren Holly as an action heroine. G. Allen Johnson of the San Francisco Examiner called the film "an absolute bore". Lauren Holly's performance in the film earned her a Razzie Award nomination for Worst Actress, though she lost to Demi Moore for G.I. Jane. Turbulence was also nominated for Worst Reckless Disregard for Human Life and Public Property but lost to Con Air. Despite its box office failure, the film did well enough on home video to become a trilogy with two new direct-to-video sequels. They are Turbulence 2: Fear of Flying and Turbulence 3: Heavy Metal, each with a different cast. ^ a b c "Turbulence". Box Office Mojo. Retrieved 2016-01-10. ^ "Turbulence Movie Reviews, Pictures". Rotten Tomatoes. Retrieved 2010-08-18. ^ Ebert, Roger (1997-01-10). "Turbulence". Chicago Sun-Times. Retrieved 2017-11-15. ^ Berardinelli, James. "Turbulence". ReelViews. Retrieved 2017-11-15. ^ Johnson, G. Allen (1997-01-10). ""Turbulence' can't shake gremlins". San Francisco Examiner. Retrieved 2017-11-15. ^ Ryan, Joal (1998-02-09). "News/ Razzies Razz "Batman & Robin"". E! Online. Retrieved 2016-01-10.